Over the summer I was in a Ten Thousand Villages store in Alexandria, VA browsing around and found a bin filled with unusual maps. Map projections have always amazed me - considering that there is no way to put the three dimensional contents of a globe onto the two dimensional contents of a map, something has to be distorted. Where do we distort? Why is the Atlantic in the middle of the map? All questions I still have unanswered. While the map with countries sized based on their population was cool (India, China = big; Europe, USA = small), I was most intrigued by the map that was inverted. Antarctica was at the top, the north pole at the bottom. I barely recognized it as the same map I've seen since grade school. So for tonight's LUCAP meeting, I made flyers with that upside down map across them. I this year in LUCAP that seasoned LUCAPers and newcomers alike have their beliefs challenged and learn about the way that others see the world. 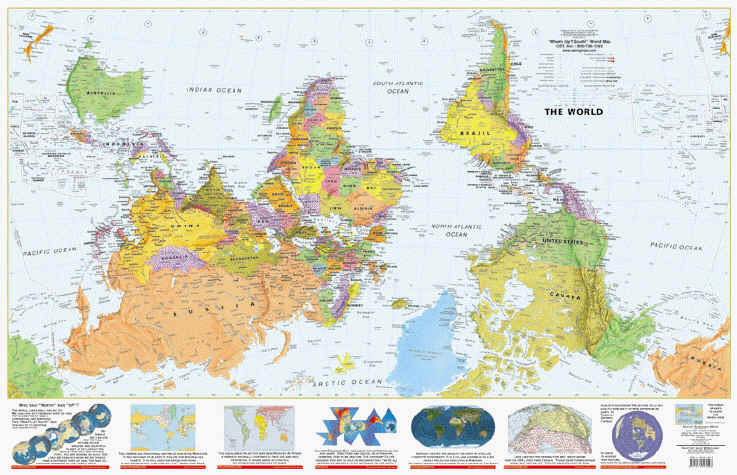 This totally makes me want to print a bunch of upside down maps and distribute them to grade schools everywhere. In my dream, a cloud of anxieties closed around me. The United States was now at the bottom. Would we have to stand upside-down, causing the blood to rush to our heads? Would we need suction-cup shoes to stay on the planet, and would autumn leaves fall up? No, I remembered, an apple once bopped Newton on the head - no need to worry about these things. Other things troubled me more. Now that we're at the bottom, would our resources and labor be exploited by the new top? Would African, Asian, and Latin American nations structure world trade to their advantage? Would my neighbors and I have two-dollars-a-day seasonal jobs on peach and strawberry plantations? Would the women and children work from dusk to dawn to scratch survival from the earth of California and Virginia? Would the fruit we picked be shipped from New Orleans and New York for children in Thailand and Ethiopia to hurriedly eat with their cereal so they wouldn't miss the school bus? Would our children, then, spend the morning, not in school, but fetching water two miles away and the afternoon gathering wood for heating and cooking? Would a small ruling class in this country send their daughters and sons to universities in Cairo and Buenos Aires?